You can own a delightful sampling of Dolores Price watercolors through a pack of notecards! 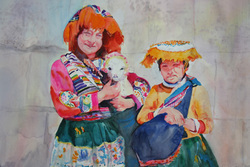 There are two packs available: Peru and Favorites. Each pack contains a selection of 15 cards out of the the Peru and Favorites collections. Please note that the collections are larger than the notecard packs, so you will not receive the entire collection. To purchase a notecard pack simply fill out the contact form here, and let me which collection you're interested in. Pack of fifteen(15) assorted notecards. 4.5"x 6.5"